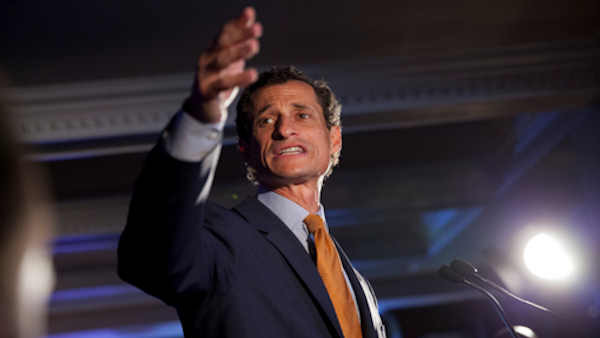 NEW YORK (WABC) -- A city official says the Administration for Children's Services has opened an investigation of Anthony Weiner's interactions with his four-year-old son. The probe is described as routine. It is unclear if investigators have talked to Weiner. Earlier this week, Hillary Clinton aide Huma Abedin said that she is separating from the former New York congressman after he was accused in yet another sexting scandal. The photos included several shots of Weiner bare-chested and two close-ups of his bulging underpants. one of the pictures, Weiner is in bed with his son Jordan while he is texting the woman, according to the Post. The tabloid also ran sexually suggestive text messages that it said the two exchanged. A spokeswoman for the Administration for Children's Services cited the agency's longstanding policy of declining to comment on specific cases to protect the privacy of the child involved. "In order to protect children and their privacy, ACS does not comment on specific cases or allegations of child maltreatment, regardless of whether or not allegations have been reported, are being investigated, or have not resulted in an investigation."